Gina left us on June 25, 2018. As a strong supporter of the METAVivor cause, it was her desire to continue to help the fight forStage 4 research. As such, and with permission from METAVivor, we are editting her original Metaribbon Challenge page to facilitate donations in memory of Gina. I have retained her original appeal for funding below this text. During the original challenge she was able to raise $1,300 to fund the invaluable research supported through METAvivor. She was a fighter till the very end, and will be greatly missed. Before I tell you about my disease, let me tell you about me, because I am not my disease. I am a wife and a daughter. I help people find health insurance. I spend most of my free time working with an organization known as Amtgard, which is a medieval/fantasy live-action role playing society. I do arts and crafts of all kinds, from spinning wool to singing, from cross-stitch to clay. I don't have any biological children, but I have those who call me "mom." I have a close extended family and a large chosen family. I am a Christian, and I believe my purpose on earth is to show God's love in as many ways as I can. I was diagnosed with Triple Negative Breast Cancer (TNBC) on January 8, 2015, just 21 days before my 33rd birthday. The tumor was approximately 7cm across in my left breast. TNBC is an extremely aggressive form of breast cancer, but thankfully had spread nowhere else. I went through a few months of chemotherapy and then had a double-mastectomy with reconstruction. Due to my age and my family history, I was tested for a cancer-causing genetic mutation. I have one of the BRCA1 mutations, which can also cause ovarian cancer. Because of this, on March 21, 2016, I had a hysterectomy and oopherectomy as well. After less than 10 months in remission, this aggressive cancer had spread to my lungs, pleura and a few lymph nodes, leading to my diagnosis of Metastatic Breast Cancer (MBC) on May 4, 2016. I went through a second round of chemotherapy and we believed I had reached NED - No Evidence of Disease (basically remission). After just a few weeks on a maintenance medication, my lumps were back. In the past two years, I have been on so many treatments that I have actually lost count. I was just recently kicked off of a trial due to "progression." I am on the search for a new treatment, and praying desperately that the next one keeps me stable at least. Unless more and better treatments are found soon, I will run out of treatment options and become one of the 113 men and women who die each day from MBC. I do not consider myself a survivor. I prefer Metavivor, because calling me a survivor adds to the watering-down of the seriousness of cancer. Having metastatic breast cancer is not pink ribbons and 5Ks and "survivor laps." It's a constant knowledge that I could be dead in 6 months, even if I'm fine today. It's my hair growing back in just enough to let me start to like it, only to lose it to chemo again. It's feeling like i've let people down because the treatment didn't work and the cancer came back. It's every success being tinged by the knowledge that it's temporary, and that, in the end, the cancer will win, and there's nothing i can do about it. There is no winning. There is no surviving. There's only fighting for more time. My dream is that one day (maybe even in my lifetime?) MBC will truly be a chronic disease rather than a terminal one. But that can't happen when it receives so little funding. If you want to help me and other patients like me, don't just share a Facebook post or wear a bracelet or t-shirt - Give. 100% of funds given to Metavivor.org go to research MBC. This is where lives can be saved. Thank you for supporting your favorite Metaribbon Challenger! 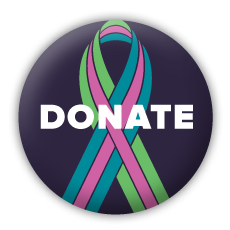 100% of your donation will be used to fund research for metastatic breast cancer treatment.